July | 2017 | Sewing Adventures…..
I’ve had such a great time sewing for the little girls and their dolls this past week!!! When I delivered the dresses and matching doll dresses, the little girls squealed with delight! That makes it all worthwhile. They immediately dressed their dolls and had to show me. I let Ella and Eva choose fabric when they visited a week ago. They aren’t necessarily what I would have chosen, but they are what the girls wanted, so that’s what I made. I have pinned the doll dress to the little girl dresses in all the pictures. I hope that will be visible enough. The first dress was the Children’s Corner “Lillian” pattern. I had a matching stripe fabric that I used to make a center panel and trimmed the panel with large rick rack. I took a commercial doll pattern and changed it up a bit to look more like the Lillian pattern. Extra large buttons finished off the front of the dress. I had to take a picture of the back of the dress to show how matching the design is such a great idea – it makes the pattern on the back of the dress flow so nicely and seamlessly. My friend, Joan Messinger would give her approval on this – she always matches everything perfectly!!! The next dress was the Children’s Corner “Lucy” dress. This continues to be a favorite pattern of mine for a quick dress. Eva was adamant that she needed the flamingo fabric! LOL! Now, we’ll see if she will wear it. She is very opinionated about her choice of clothing (at 4 years old!) and has nixed most of the things that I make. I think that the doll dress may be the ticket to wearing this outfit, but we’ll see. I used the same pattern for her doll dress as I did for Ella’s doll dress, but changed it up for shoulder snaps. Silly me, I didn’t think about it being more tricky for a 4-year-old to pull up a dress on a doll. The cherry outfit was my choice. I used the Bonnie Blue “Claire” pattern for this outfit. I had heard that these patterns run very large, so I made a size smaller than I would have normally chosen, and it is still very roomy on Ella. I trimmed the top with spaghetti bias and then used the same for the shorts to tie it all together. The smocking design is one that I have drafted and changed up a bit for each outfit that I make. I still am not 100% satisfied with it, so will do a few more changes the next time I stitch it. I tied the spaghetti bias into bows at the side seam of the shorts and then hand-stitched through the center of the bow to tack them so that they wouldn’t continually come undone. Sorry for the slightly blurry back picture – it is the only one that I took and I didn’t realize that it’s not so sharp. The double back buttons are cute, but I think they may be a bit tedious to do up for each wearing. We’ll see how mom feels about this before I make another double back button top. If it is too much trouble, I’ll draft the back to be a single button back. I still need to make a matching doll set for the cherry outfit. I’ve found a pattern that I think will work. Because I’m saving the Frannie dress in my previous post for Livvy’s birthday in October, I needed to make her a dress and matching doll dress as well. For her dress, I used one of my inserts from my stash of Beaux et Beaux inserts. I always get questions about where to buy these inserts, so I’ll answer that right away – they are not selling the inserts any more. Sometimes you can find an insert for sale on Ebay or Etsy. I’m glad that I purchased so many when I did – they have come in handy when I’ve needed a quick dress and the quality of stitching is fabulous! Livvy was thrilled with the “fairy” dress but noted right away that the dolly dress didn’t have a fairy on it! Hahaha!!! I should have used some machine embroidery for that, but didn’t want to spend the time hunting for the right size fairy for that. Perhaps for Christmas….. It continues to amaze me that these inserts are stitched with only 2 strands of floss for the picture smocking – such detail!!! I love sewing for the little girls and happily will make matching dolly sets. I know how quickly they grow up, so I’m enjoying this stage of their life! I hope that you’re stitching something that you love!!! This entry was posted in doll, picture smocked dress, picture smocking, smocked play clothes, smocking on July 20, 2017 by Kathy. After a week of frantic sewing to meet deadlines last week, I chose to do some enjoyable sewing for the grandkids this week. It was just what I needed! I’ve had such fun working on this latest project. One of my favorite dresses is the “Frannie” dress by Lyn Weeks. The dress pattern was inspired by a vintage pattern, which I feel sure has something to do with why I love it. I really love vintage pattern styles. The sleeve treatment is a bit tricky to accomplish, which causes many seamstresses to give up on sewing this pattern. I’ve been participating in a sew-along on one of the sewing forums, and it has been fun to see what everyone is working on. I have finished my dress, along with the matching doll dress and am very pleased with the results. The original pattern by Lyn has the doll dress pattern included in the larger sizes, which is called “Frannie’s Big Sister”. Martha Pullen/Sew Beautiful purchased the pattern rights from Lyn several years ago and sold the pattern, but I’m not sure that you can still buy either of the patterns from them at this point. The original patterns from Lyn came in a cream colored envelope. In the pattern is a black and white photo of a suggested smocking design, but no graph for it. I have followed the picture in the past and smocked that design, which is quite pretty. However, for this dress, I chose to use the design that I did for Australian Smocking and Embroidery magazine for my “Paisley Park” outfit (Issue #84). After getting the geometric smocking finished, I decided to not make the flower petals, but to leave the flower centers as polka dots and then did an outline stitch around the dots and a French knot in the center. I think it goes well with the fabric. For the matching doll dress, I attempted to mimic the design on a smaller scale. I’m happy with they way that it turned out, though it has less detail. The pattern looks big for the little girls, so I think I’ll save it for a birthday gift in October. I think it’s going to be a hit! After all, what little girl doesn’t love matching her dolly!!! If you manage to find this pattern on the second hand market, you may want to pick it up since they are getting difficult to find. I hope to start stitching a more traditional dress from this pattern next! What fun projects are you stitching this summer??? 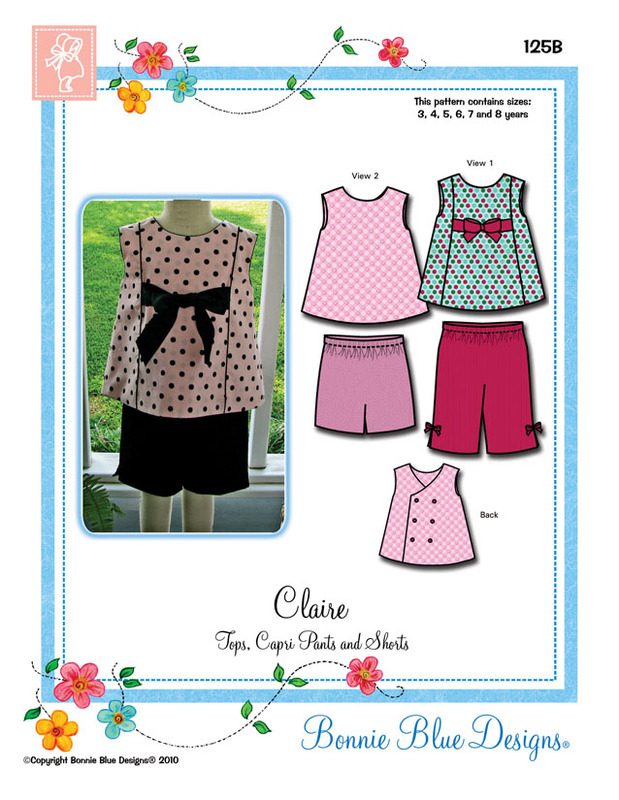 This entry was posted in Frannie, Lyn Weeks, smocked play clothes, smocking on July 14, 2017 by Kathy.